It is imagined by some today that the iconographic tradition, which we tend to associate first with the styles of Greek and Russian icons, is an unbroken tradition. The Eastern iconographers, it is said, remained true to its principles, unbending, while the artistic traditions of the Roman Catholic Church degenerated under the influence of the Enlightenment and modernity. In fact, the story is not so simple as that. While there was no High Renaissance in Russia, for example, some aspects of the Enlightenment did take hold there, and we see neo-classical influences in Russian icons after the time of Peter the Great. The great work of restoring the tradition was done largely, but not exclusively, by Russian expatriates living in Paris in the mid-20th century. 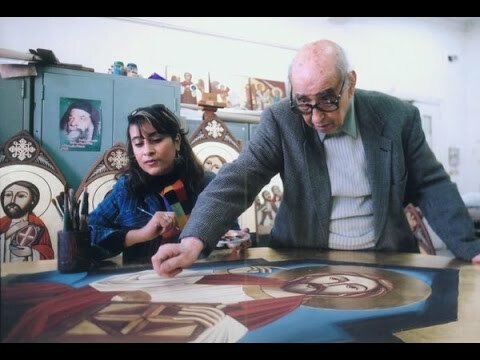 These are both theorists such as Leonid Ouspensky, Vladimir Lossky, and Paul Evdokimov, and painters who worked them with such as Gregory Kroug, Ouspensky again (who was both painter and theorist), the Greek Fotius Kontoglou, and the Egyptian Copt Isaac Fanous, who died in 1970. It is a tribute to how successful they were that many today are unaware of their importance. The quality of iconography we see painted today is so high and consistent with the works of the past that many imagine that the line of quality was never broken. This should be an encouragement to those of us who are seeking to see a similar regeneration of the Western traditions. It is possible! Another mark of a living tradition is that it continually reinvents itself without contravening the core principles that define it. Every tradition must reapply its core principles to speak to the people of its age, otherwise it will die. It must discerningly engage with the culture outside the church building, taking those elements that are consistent with its Christian form. Then it is equipped to speak to contemporary man and will, in turn, enrich the contemporary culture in which it now participates. This adaptation to the modern age in a way that does not compromise the essential elements is what we are seeing happening in modern iconography. 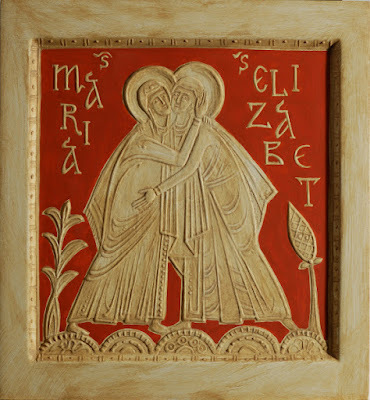 It is exciting to see how iconographers from Russia, for example, are so sure of their own foundations that they can create an authentic 21st-century iconography that nevertheless is connected to that of Andrei Rublev and Dionysius, artists of the medieval Novgorod school. The work of Olga Shalamova and Philip Davydov, who together founded the Sacred Murals Studio in St Petersberg, in my opinion conforms to this ideal. Theirs is work that could never have been done in the 15th century; the color palette and the film-animation influenced flow of the line that defines the forms is of today. Yet they are authentic and beautiful holy icons. They are also excellent teachers who regularly give workshops in the US, Italy, and Australia, and I would encourage anyone who is serious about learning to paint icons to consider them as teachers. I intend to show some of Philip’s icons next week, but this week offer the relief sculpture of Olga. She “sculpts”, because she builds up layers of gesso (ground chalk set in animal glue) in selected areas, bit by bit, rather than carving, which is cutting down into a deep, flat layer. Gesso is the ground which is usually used in icons as the surface put onto the wooden substrate and on which one paints. This how Olga is able to combine the relief image with some restrained use of color.